Maybe you’ve had a pool before. Maybe you haven’t. Either way, we know you want one now. Having a pool or hot tub, or a combination of the two, is a great way to spend some time relaxing. You can host family and friends in an environment that will please everyone. 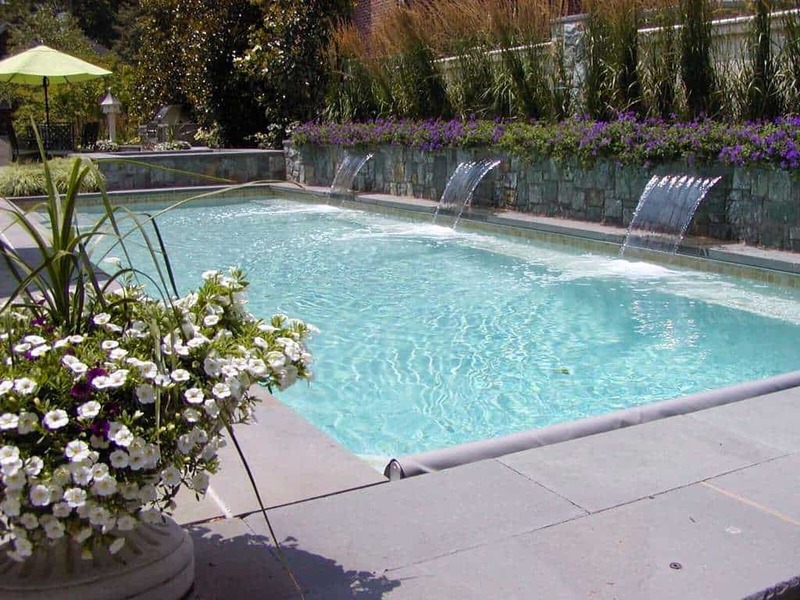 There area so many possibilities for your pool, from the style of the pool itself to the surrounding pool deck. Don’t get overwhelmed by the options. You probably have some ideas of what you want, so work from there. 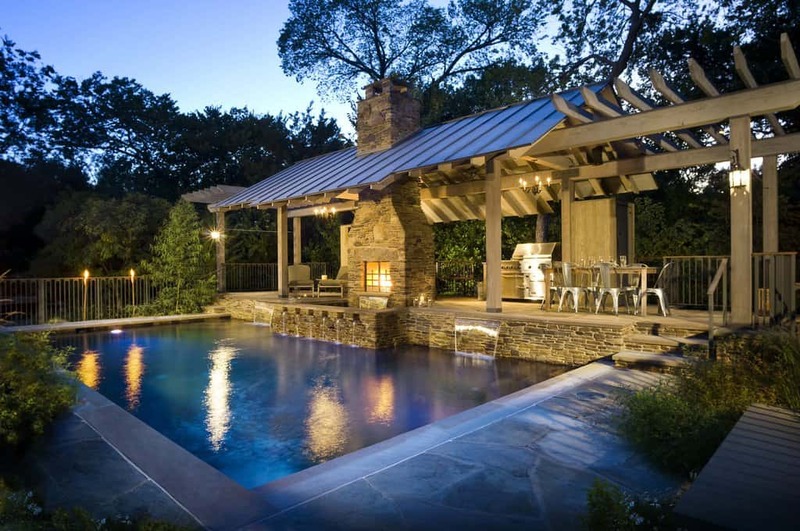 Below, we have gathered 46 different pool and hot tub designs for you to look at. They range from luxurious and elaborate to modern and functional. Take some time and look through what we have here. We know you’ll find something you like. 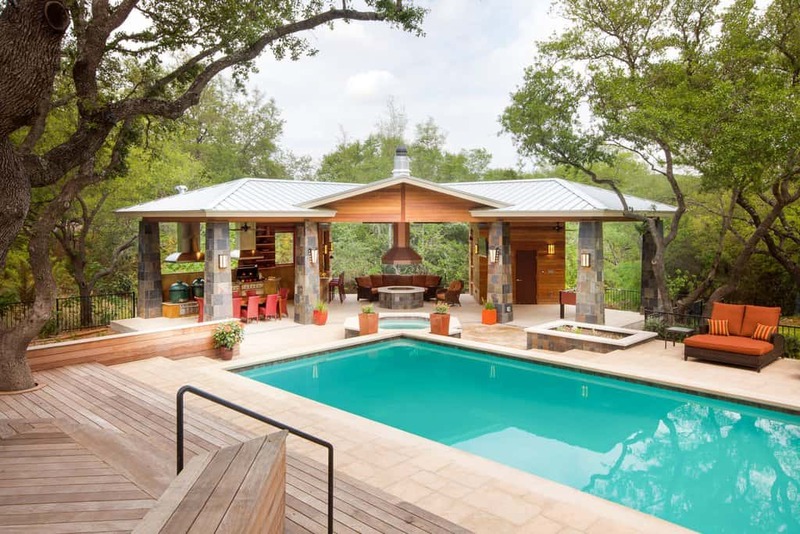 With a completely relaxing environment built around this pool, from the sleep designed stone to the fire pit, this blue water will calm you anytime. This pool and hot tub area comes to life withe colorful wall and great plant life to brighten up the space. This pool deck features a cobblestone design and will give you and friends plenty of space to lay out when you aren’t in the pool. 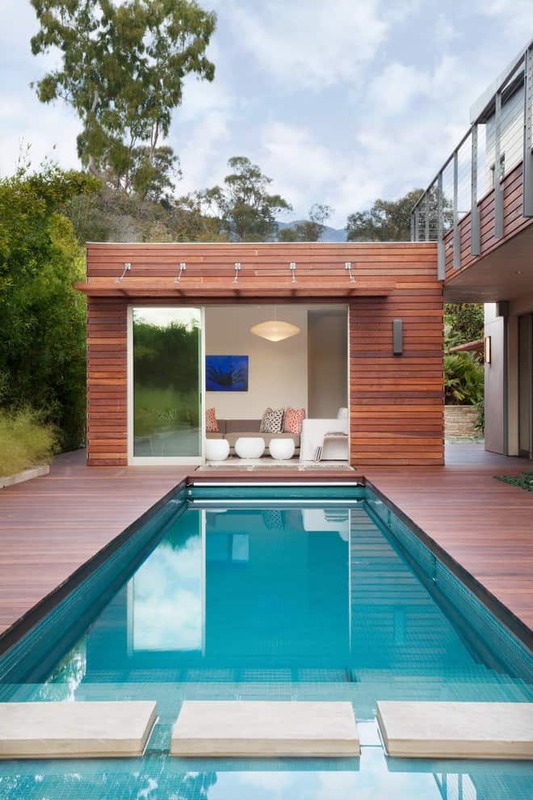 Sometimes a simple wooden pool deck is all you need to make an area great. The sunshine will keep you warm until you are ready to jump in the pool. 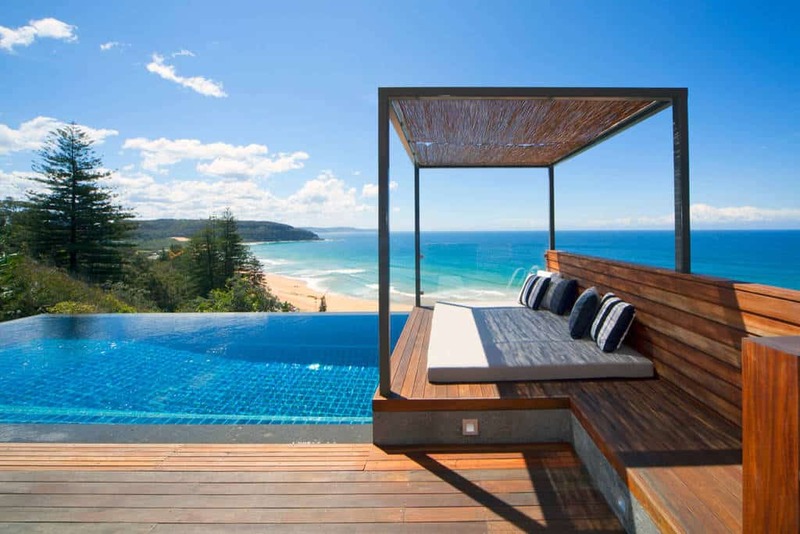 The water spills over the edge here to make this infinity pool a luxurious space. Relax around great landscaping before you take a dip. 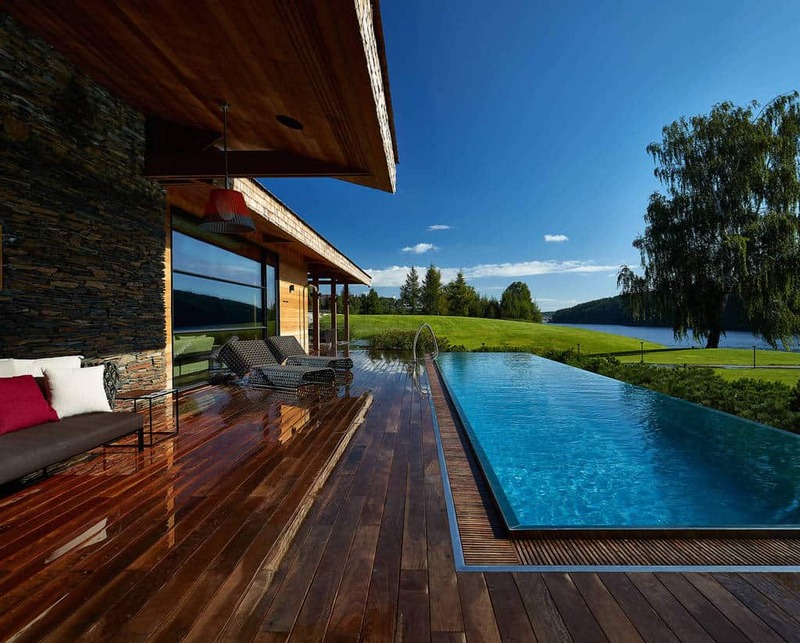 This pool blends perfectly with the house that surrounds it. 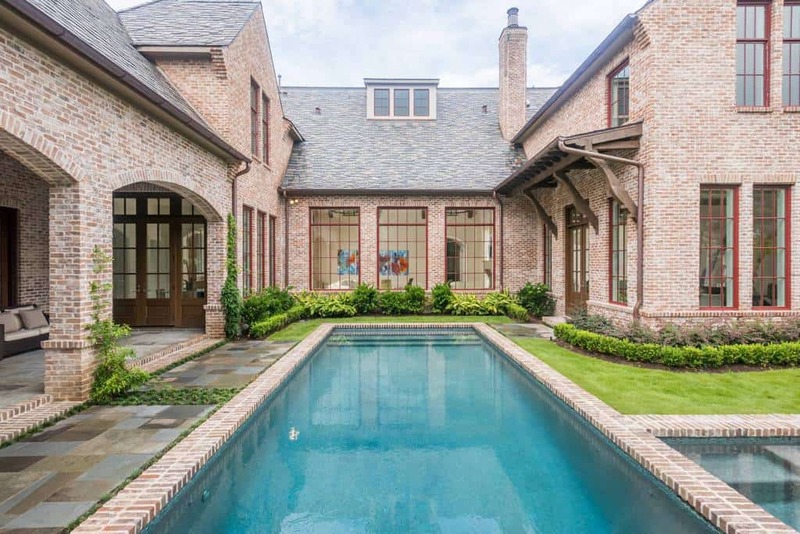 The brick around the pool give it a timeless character. This pool is the center of attention, surrounded by comfortable seating, an area to cook, and a space to eat. 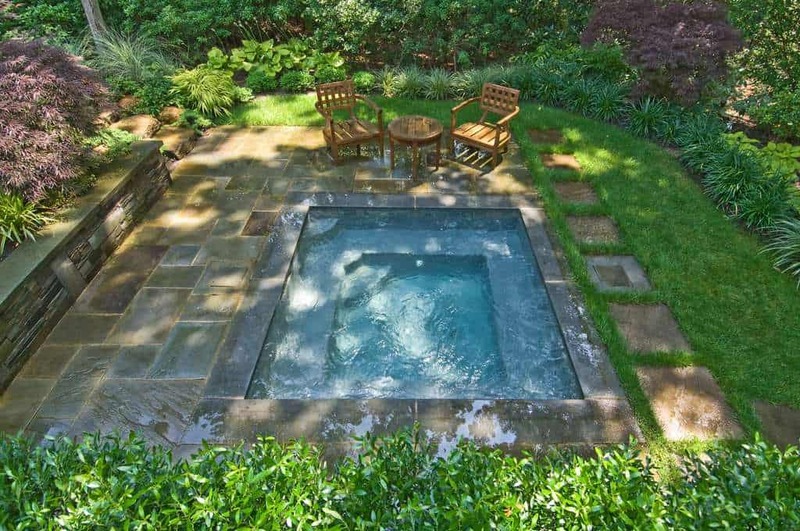 Welcome to a well manicured backyard, where you can find a calm pool to cool your day down. This pool is walled with large rough bricks, just like the house. With a hot tub nearby, this area will be your place to go. With this large concrete pool deck giving you plenty of space to lay out and relax, you can decide whether you are going to the hot tub or the pool. This pool shines blue thanks to the great lighting used around it. 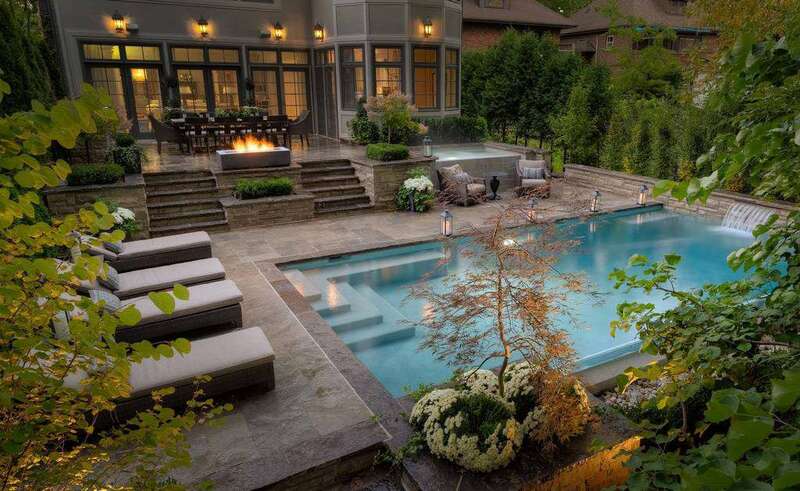 This pool space and the yard around it blend for perfection. 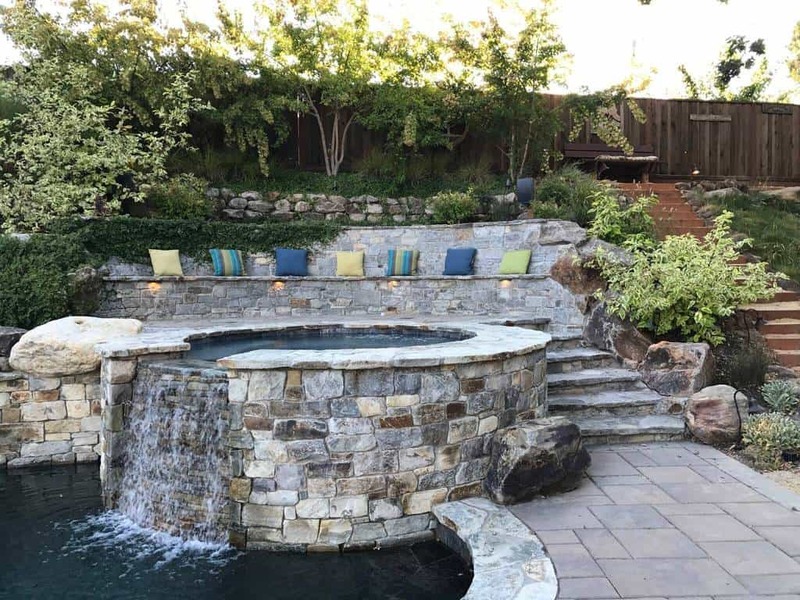 Going for a natural look, like this pool and hot tub that use stone and a fall, will bring great character and life to your yard. 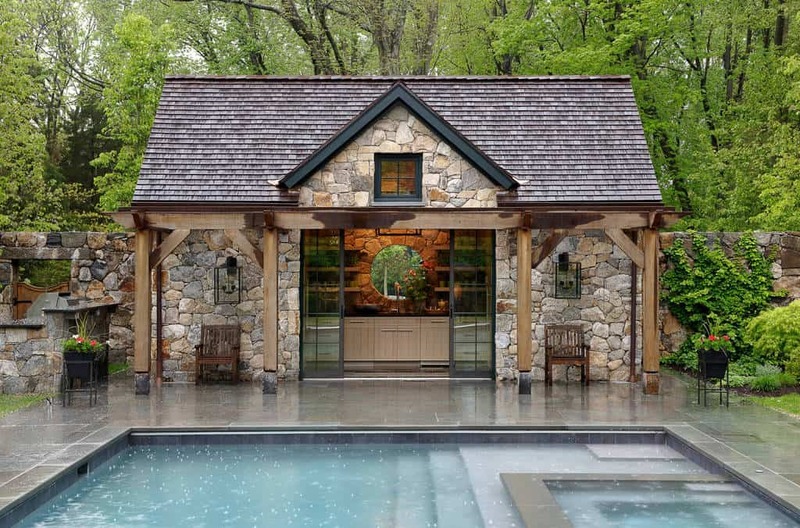 The pool deck and the little pool house are brilliantly finished with darker hardwood. This area has comfortable chairs and a couch for you to spend your time on. 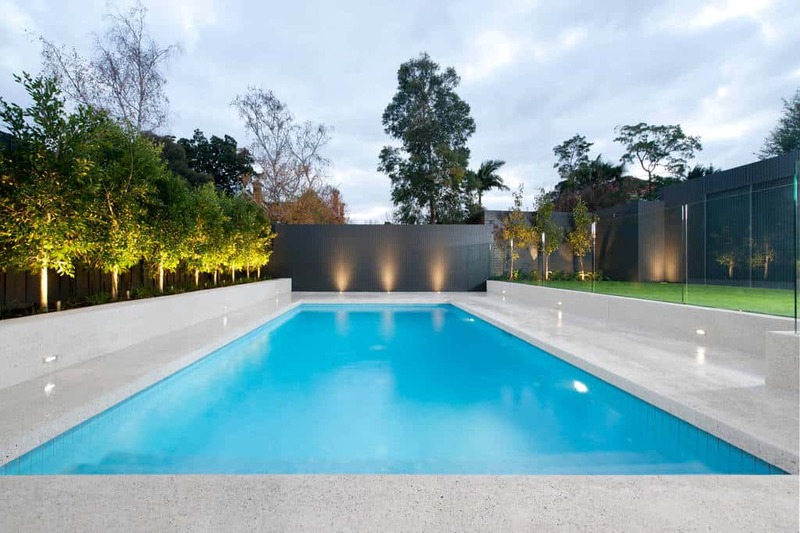 The evening brings a relaxing glow thanks to this calmly lit pool. Spend some time by a warm fire before you get back in the pool. 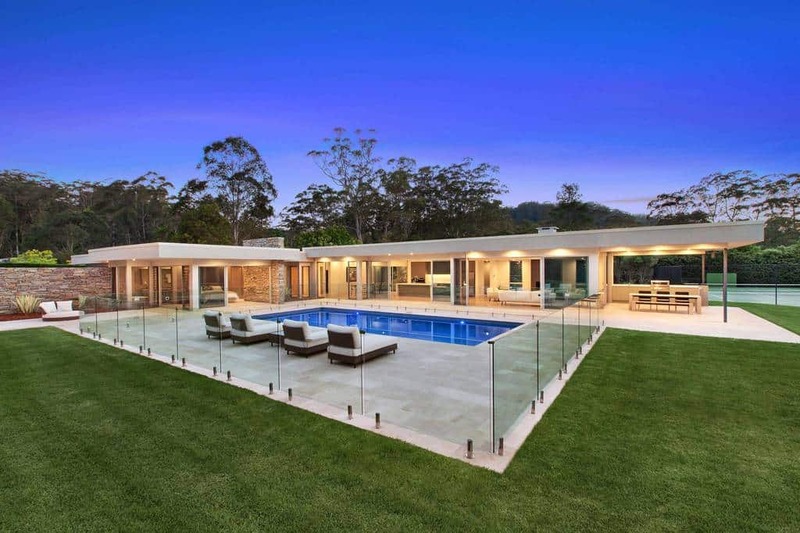 This contemporary home is melded with a pool that lights up calmly to show off its style. This area will see you host family and friends often. 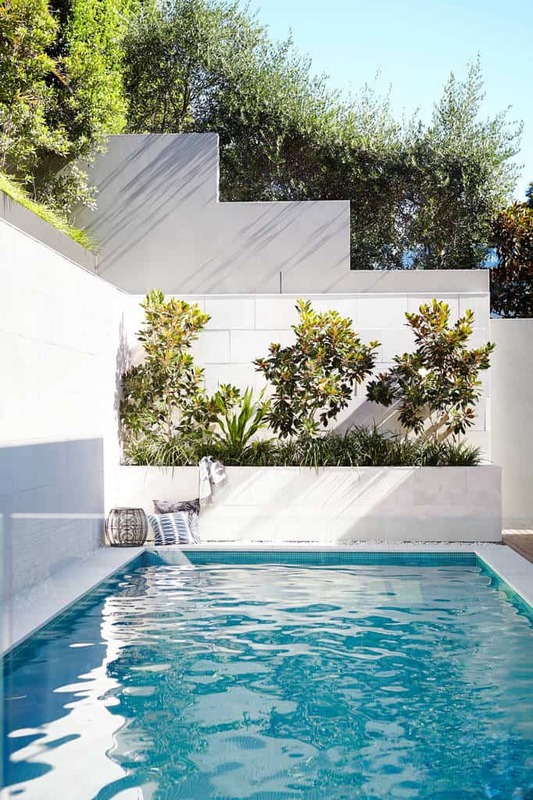 This pool curves against geometric convention to blend with the surrounding landscape. When you aren’t in the pool relaxing, you can find some time to prepare a quick meal in the pool house. This pool follows the yard around the house, has a great fountain, and is surrounded by great landscaping. Like a scene from a Spanish villa, this pool is surrounded by luxury. It curves and meets at the hot tub. 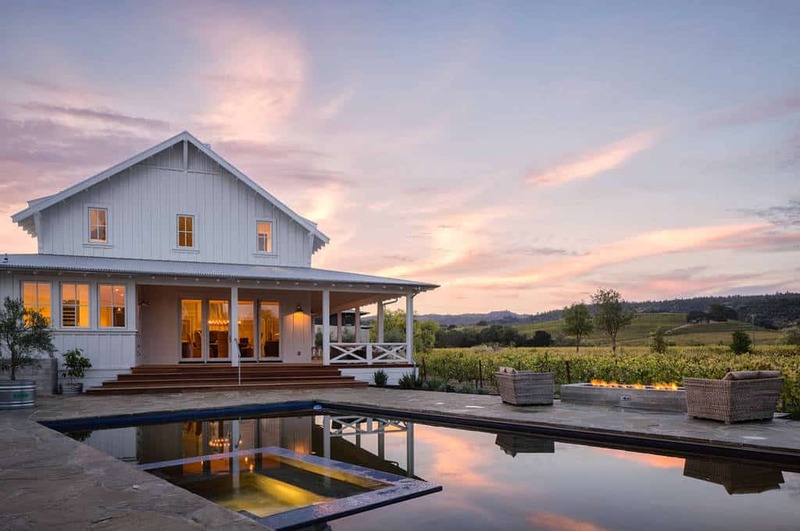 Photo by Balfoort Architecture, Inc. The hot tub and the pool are separated by great steps across the whole area. 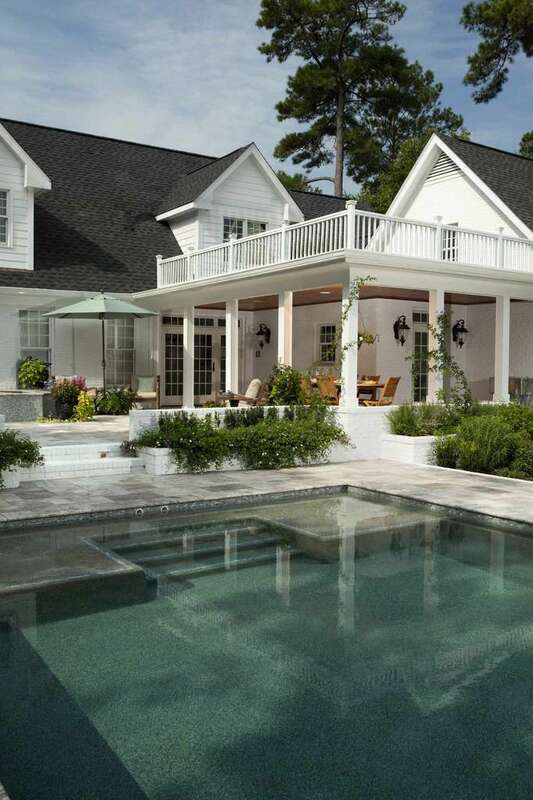 This pool is the center of the attention for this house. Like something out of a great resort, you can landscape your pool area to perfection to bring it great style. Don’t worry about walking around this pool. Just take a walk across to the other side. These steps separate the hot tub from the pool. With a unique design that sees you walking up the stairs to the hot tub and pool, this area is like a tropical paradise. 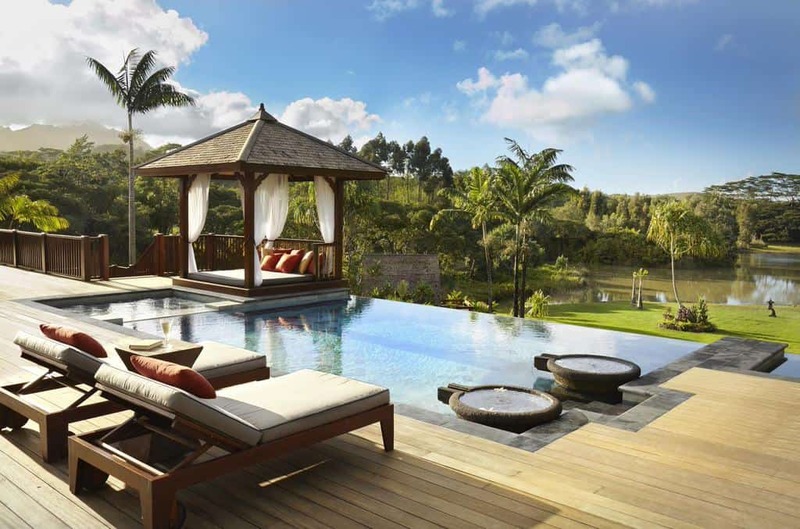 Like a tropical cabana, this infinity pool looks out over the water and has a great wooden deck that you can relax on. Photo by Barry Block Landscape Design & Contracting, Inc. This area is like having your own personal, and private, relaxation pond. Relax here surrounded by great landscaping. 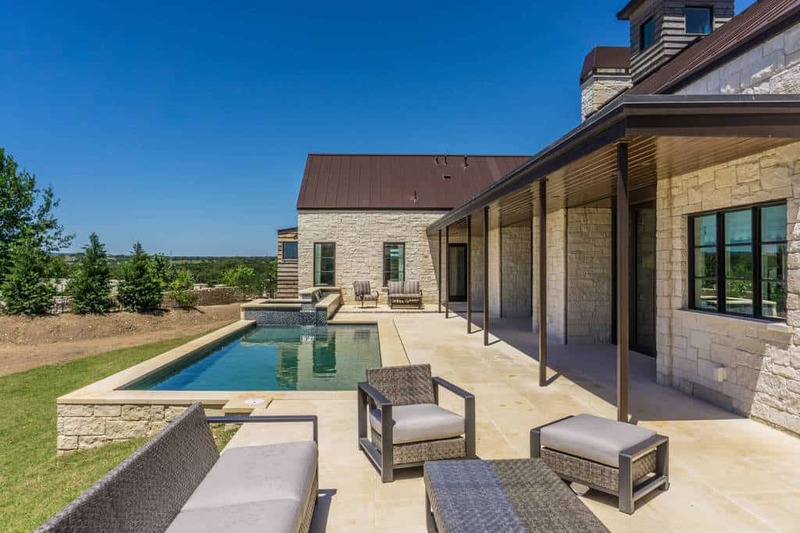 Photo by Lang Pools Inc.
With a pool deck that uses a fantastic smooth stone design, the only choice you have to make is whether you want to go to the pool or hot tub first. This pool area features plenty of space for you to entertain family and friends. The pool deck is glassed in to keep the yard separated. 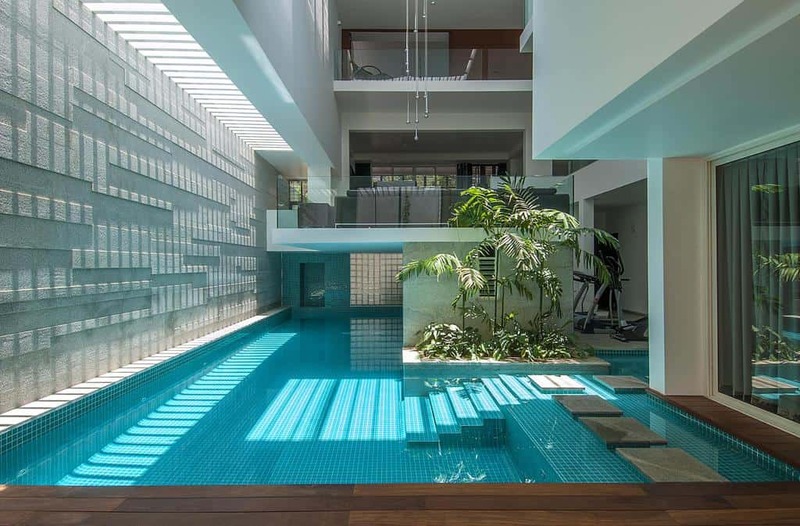 The pool is the center of attention inside this house. Accessible from a few areas, you can exercise then take a cool swim. Relax, lay back, then take a dip in this infinity pool that features the perfect view of a beach paradise. Photo by Pool Environments, Inc. Designed to have a deep blue look, this lagoon is surrounded by a contemporary rustic feeling, from the stones to the fireplace. Designed to have a natural feeling all around, this pool curves up to the stones and will have your mind going to a hidden paradise. It all appears flat like glass. Infinity styles here for both the hot tub and pool, you can sense the luxury here. Let this area be your own private getaway from the world around you. Walled high all around for privacy, this hot tub and pool combo will be perfect for you. 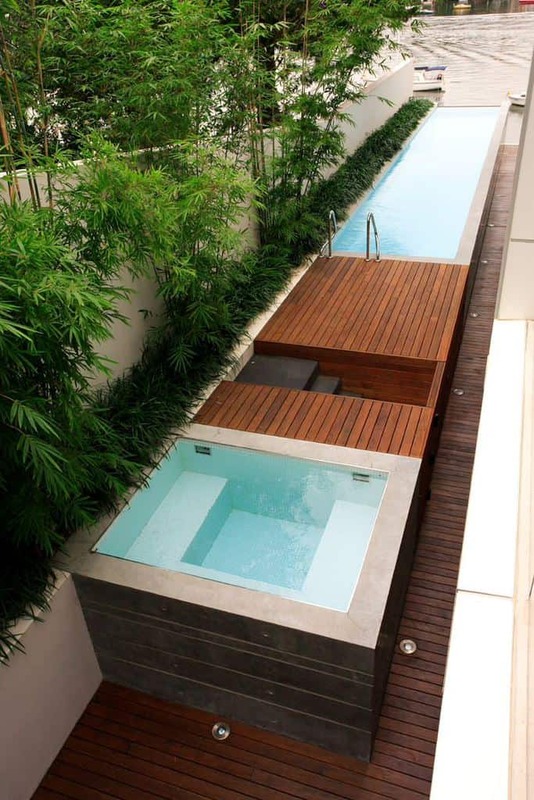 You don’t have to settle for a typical concrete or wooden pool deck. Make the landscape part of the design. 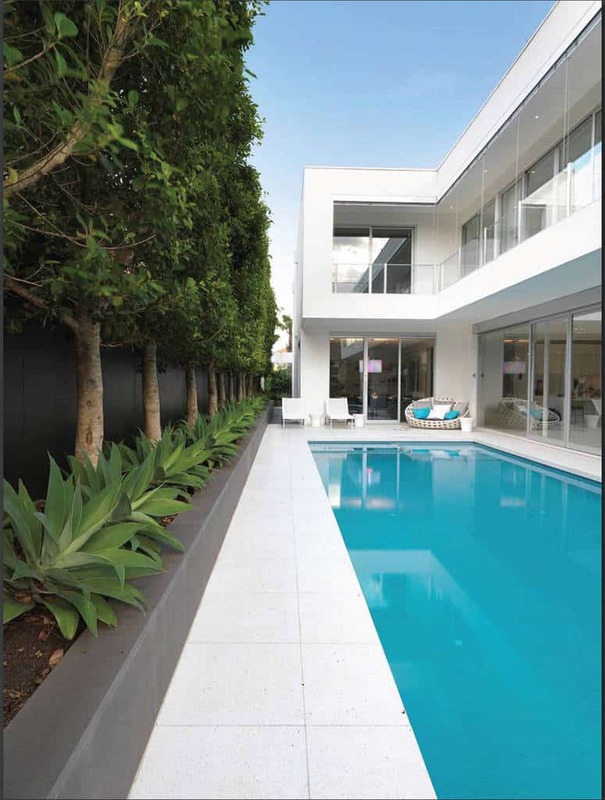 Darker bottom pool can bring a whole new sense of style and luxury to an area. This pool demands to be looked at. And used of course. 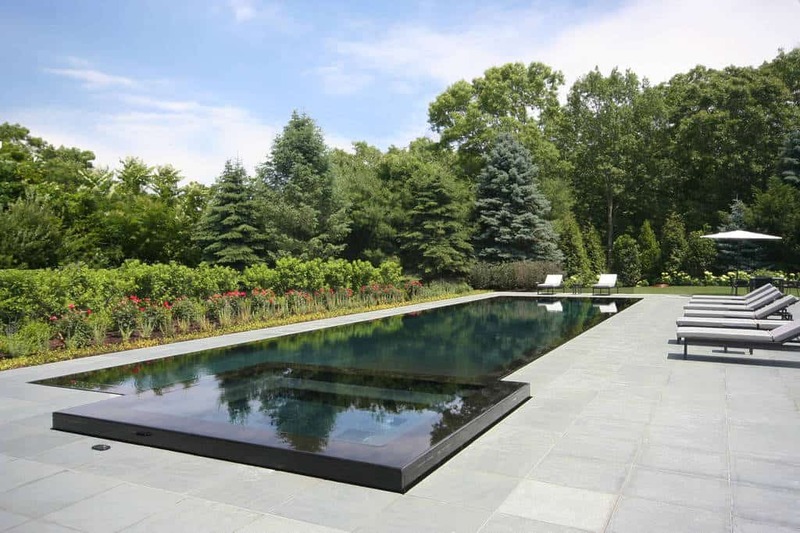 The stone design used around this pool gives it a sense of style that other pools lack. Relax your day away out here. Get creative with the designs around your pool. This one is surrounded by a step-down wall and great plant life. Dark hardwood can be used to create a romantic place that you will always enjoy coming to. The pool and hot tub glow from below to bring out a sense of calming peace. Enjoy this outdoor area and relax the night away. 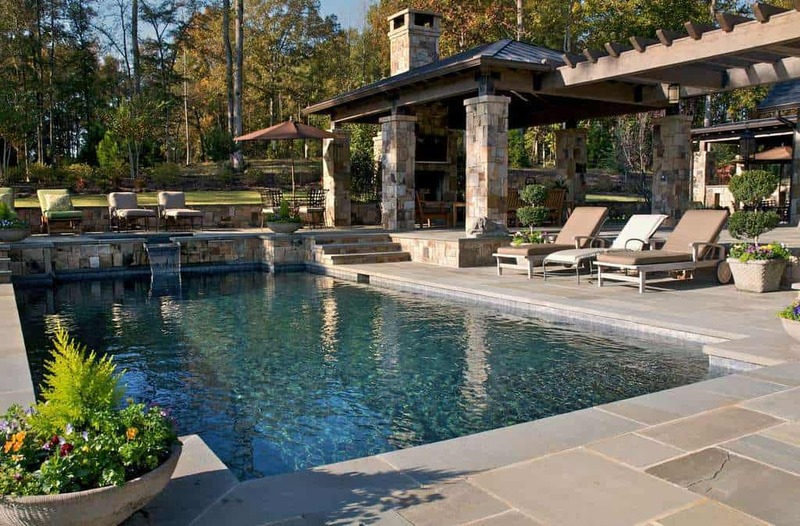 This hardwood and dark stacked stone design around the pool contrast well with the cool blue of the water. 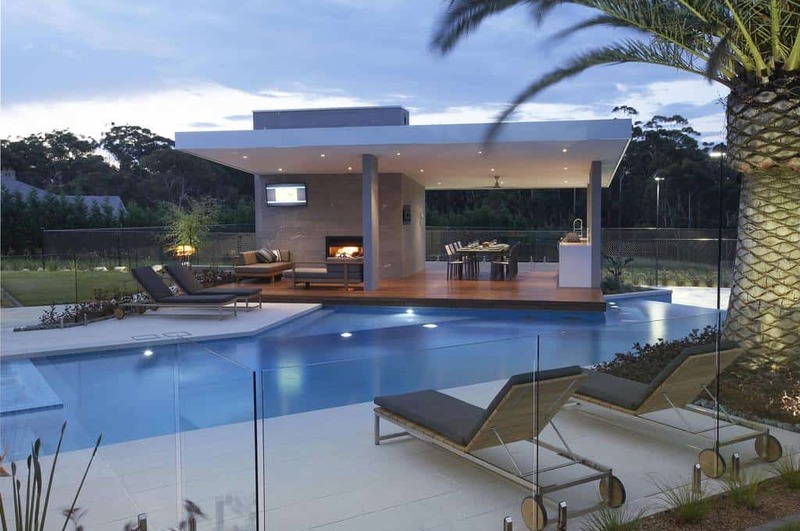 With an open area that allows the beautiful landscape to be seem, this pool and hot tub glow with serenity. With a shallow area featuring built in relaxing spaces, you can always have the water at your feet. Jump in the deep end anytime. 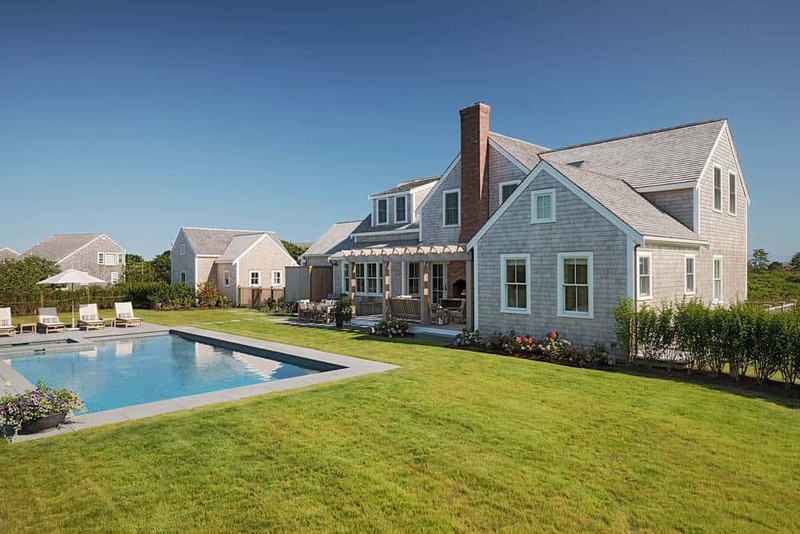 Photo by DANIEL HUNTER AIA Hunter architecture ltd.
With a quaint country charm with the style, this pool fits right into the design of the backyard. With a great blue design on the bottom of this pool, the contemporary style of this indoor area will see you enjoy the water all year around. These three calm fountains spill water out into the pool. You will always fine peace in this colorful space.